The last two days have been nothing short of spectacular. Yesterday Flamingo Sunrise, Hot Tuna, and I summited Mt. Whitney for sunrise. Mt. 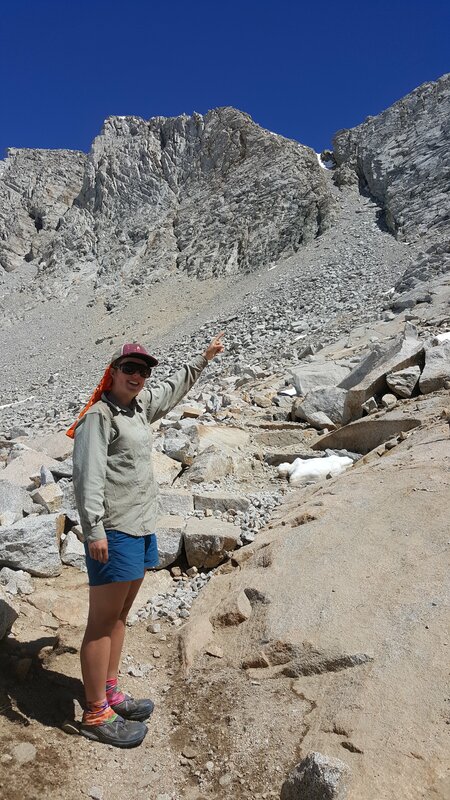 Whitney is the highest mountain in the lower 48 states at 14,505 feet, and it is a popular side trip off the PCT. 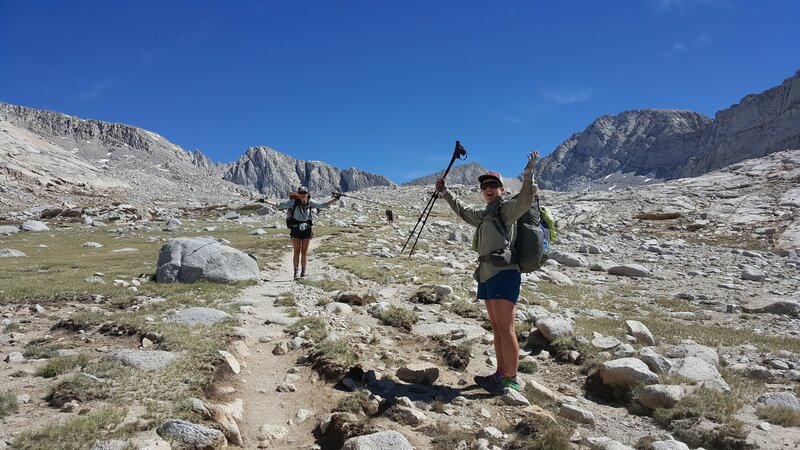 Today, we carried on and went over Forester Pass, the highest spot on the PCT at 13,153 feet. Hot Tuna at the summit of Mt. Whitney. So much has happened in the week since we left Kennedy Meadows. 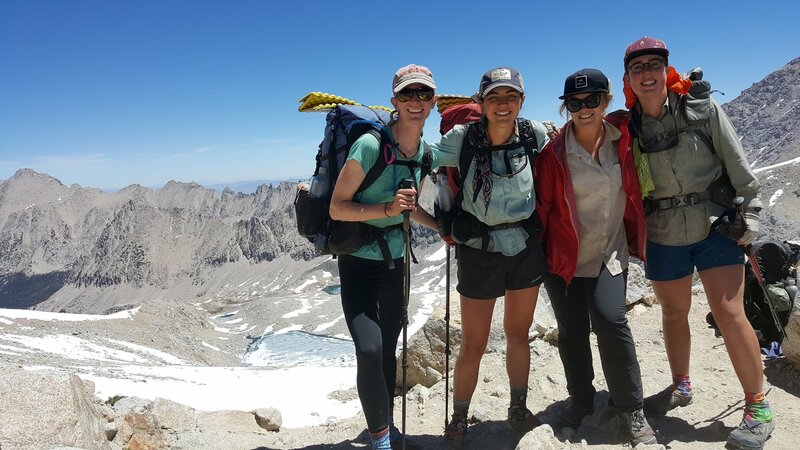 Spending a seven-day stretch in the backcountry has been a great way to start the Sierra section. Because it’s so fresh in my mind, I am going to start with what happened today (June 19, day 52) followed by yesterday and then the rest of the week. I am writing in my tent at Vidette Meadow, at mile 787. The sun is getting lower and the light on the peaks towering above us is beautiful. The fact that my tent has mosquito netting is also beautiful. 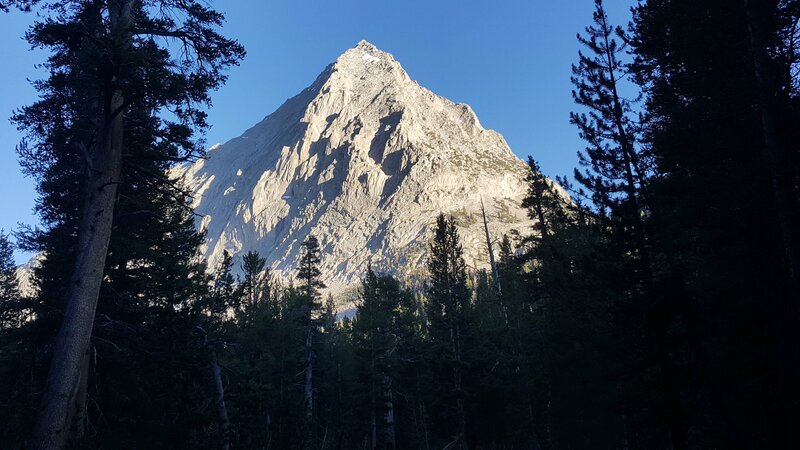 The mountain above the tenting area at Vidette Meadow. Today was the most fun day I’ve had on trail. The scenery was spectacular, the climbs were satisfying because I could see my progress, and I felt great physically and mentally. It is not hard to feel motivated and excited to hike in a place as gorgeous as this. Flamingo Sunrise and I are stoked to be hiking toward Forester Pass! 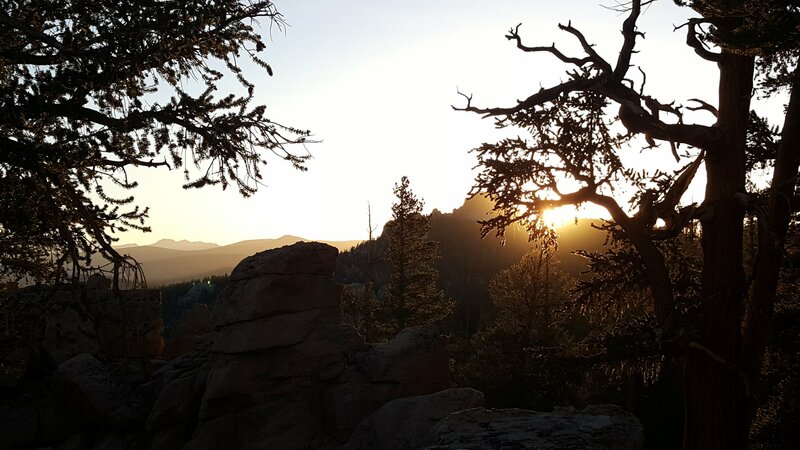 I woke up this morning excited to experience Forester Pass. 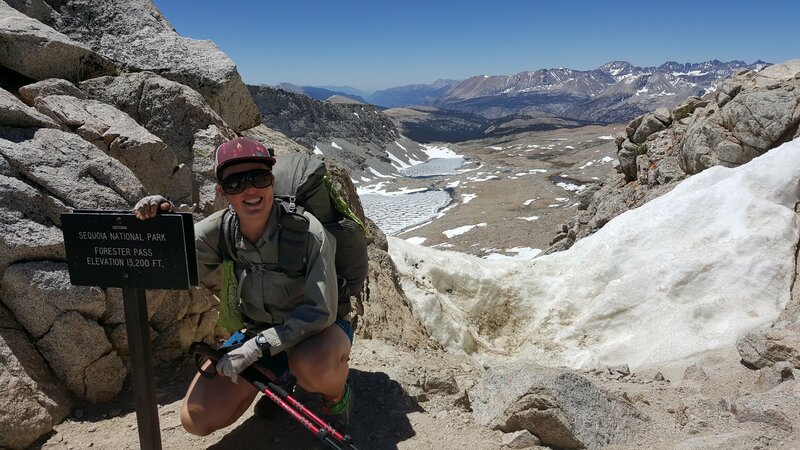 It is a PCT milestone and gets talked about a lot because you have to cross a steep snow chute near the top. 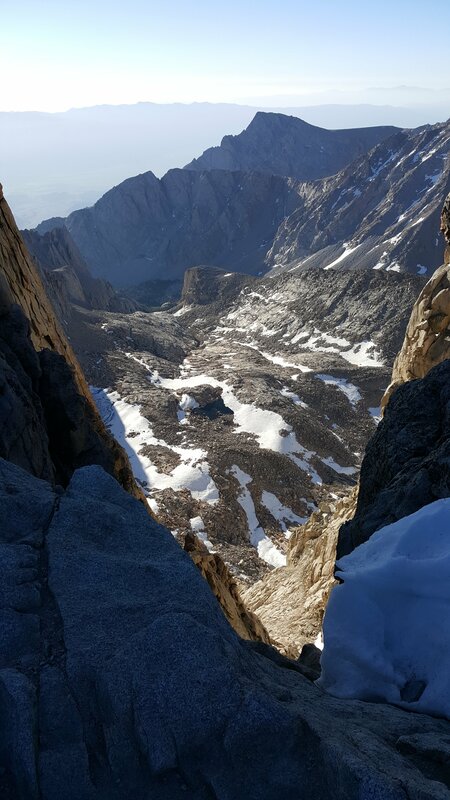 This chute can be scary in high snow years and early in the hiking season. See that little notch with snow at the top? 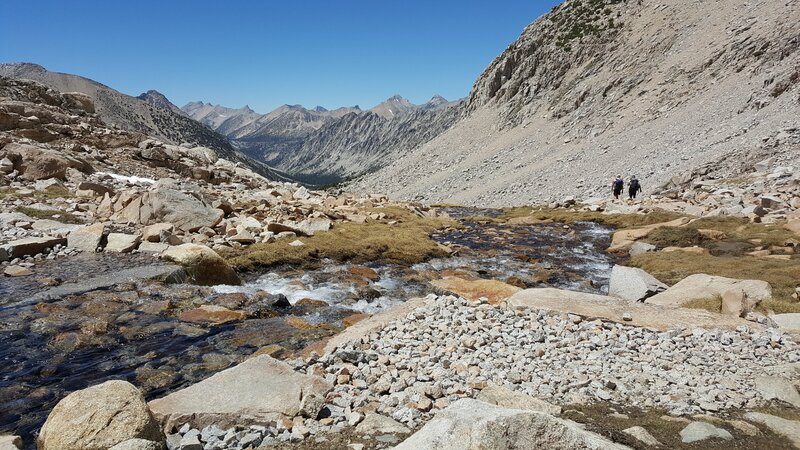 That’s Forester Pass. 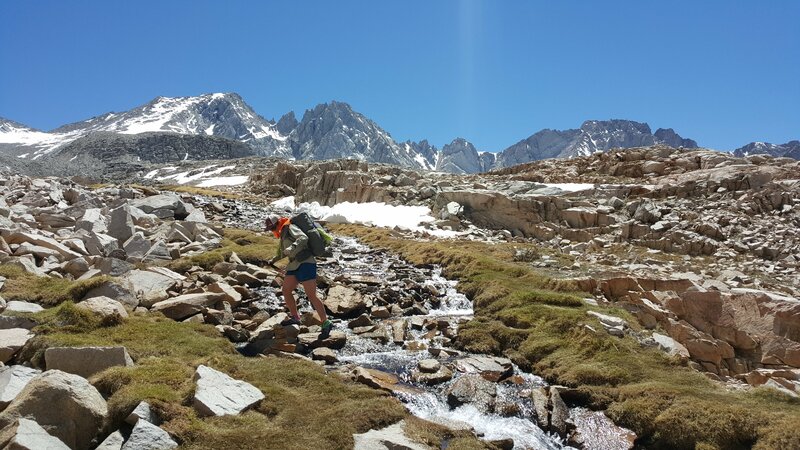 Luckily for us, there was enough snow to make for an exciting glissade down the north side, but there was little snow on the climb up and the chute was easy to traverse with only trail runners. Sliding down the other side was super fun and saved us a whole lot of time and postholing. I was so stoked that I didn’t notice how crooked my hat was. 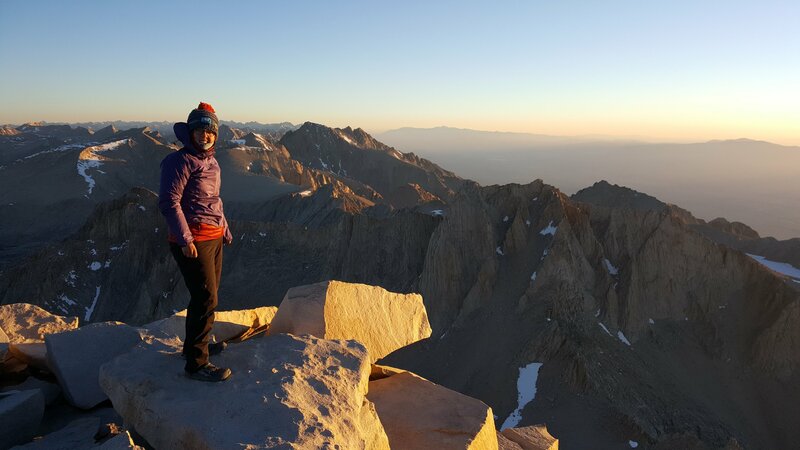 Hot Tuna, Flamingo Sunrise, Daiquiri, and me at the top of Forester Pass, overlooking the north side that is in Kings Canyon National Park. Whee! 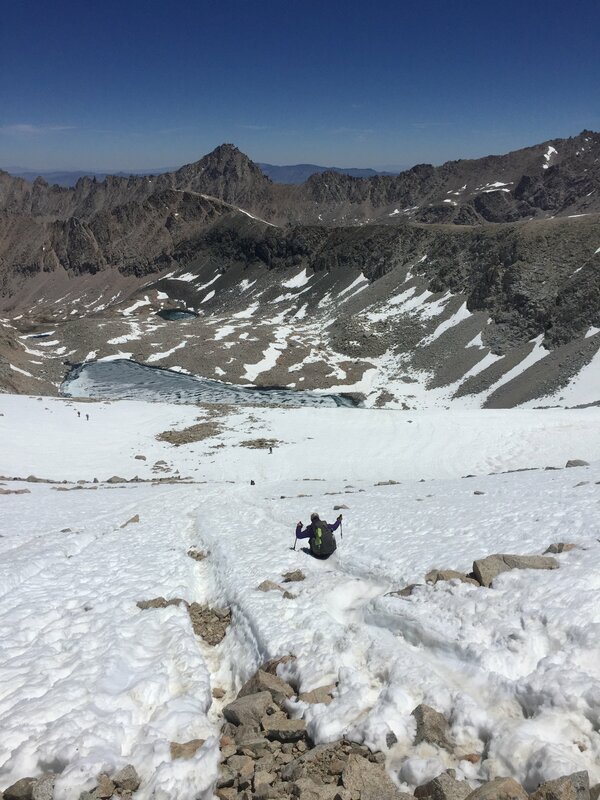 Here I am glissading down from Forester Pass toward those rocks at the bottom. We descended the rest of the day and passed many lakes and rivers. The abundance of water is wonderful after spending a month and a half being so focused on having enough of it. This was one of my favorite spots. It blows my mind that it was only yesterday morning when we summited Mt. Whitney. 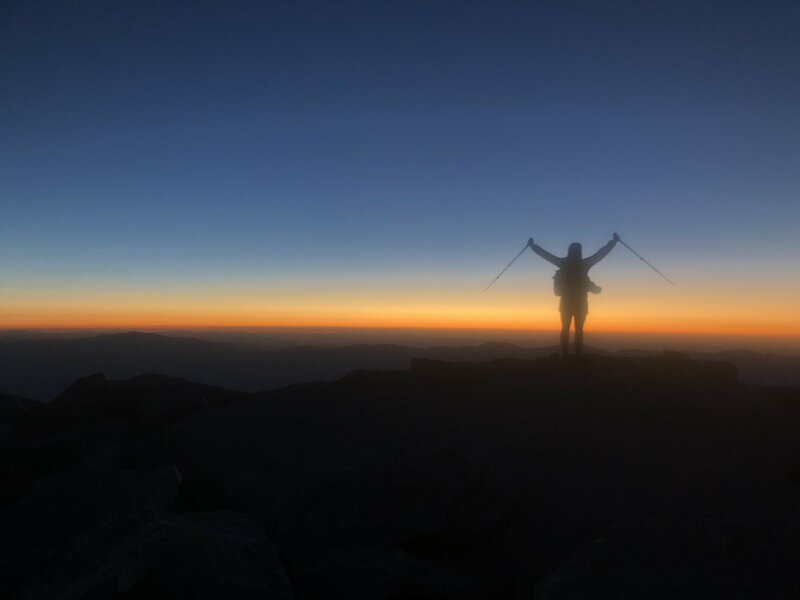 Flamingo Sunrise, Hot Tuna, and I decided that we might as well plan to summit for sunrise – which meant a 1:15 a.m. wakeup and a 2 a.m. start. 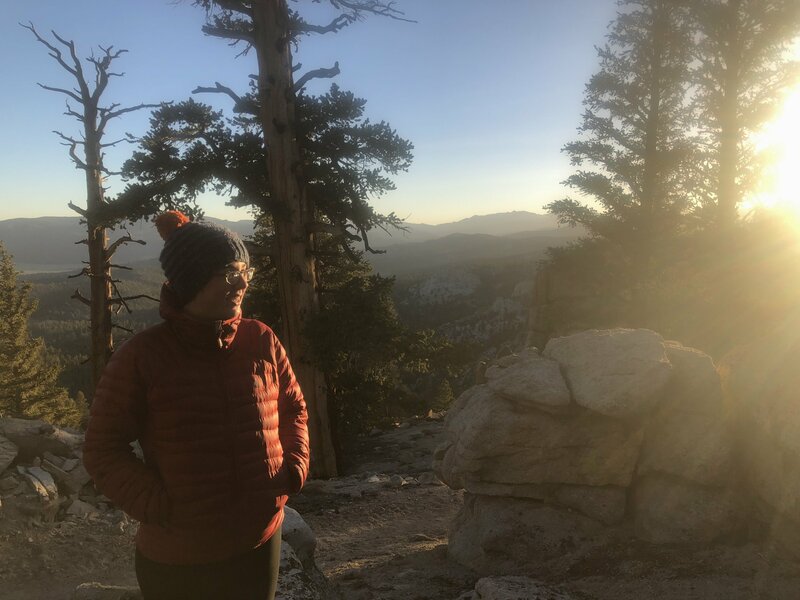 I felt great on the way up – it was cool but not cold, so the hiking was comfortable, and the darkness prevented us from seeing just how many switchbacks we were climbing. The stars were some of the brightest I’ve ever seen and we saw shooting stars while we were hiking. As we climbed higher the trail got more technical and my headlamp batteries were dying. Funny how you don’t notice these things until you’re on the side of a mountain. Reaching the summit just before sunrise. 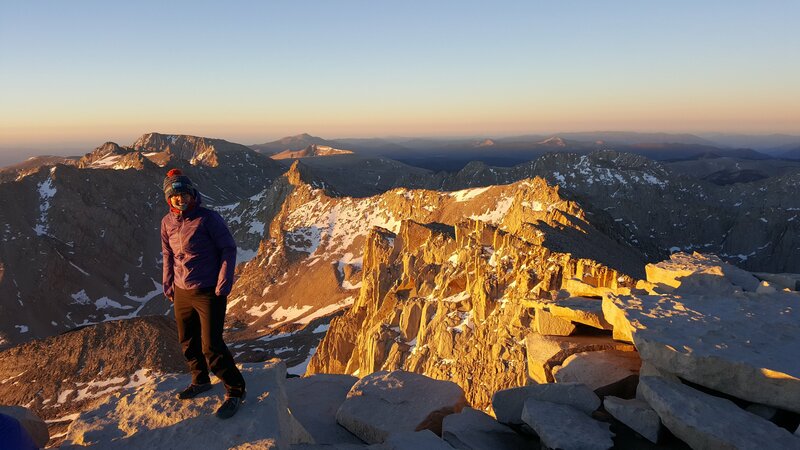 By the time we reached the summit it was around 4:50 a.m. and the wind had really picked up. We were warned by other hikers that it would be seriously cold so we were wearing all of our clothes plus our sleeping bags. My water bottle froze quickly and I’m guessing with the wind chill it was at least -10 C.
The sunrise was amazing; watching the golden light illuminate the mountains around us was beautiful. I took some photos for a French father/son duo with their retro film camera – which absolutely froze my hands. Luckily they exchanged the favor and took some photos of me that are the best keepsake I could ask for. Chilly but beautiful. At this point I still felt relatively good. 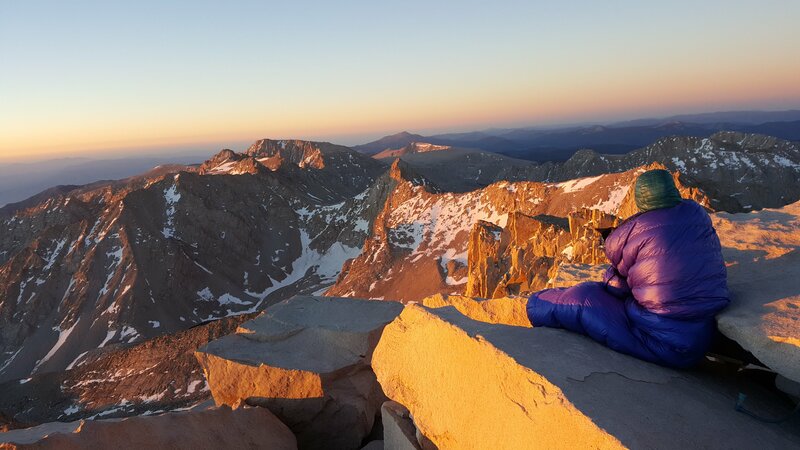 Once I sat down for a few minutes, wrapped up in my sleeping bag trying to thaw my fingers, I began to feel really sick. 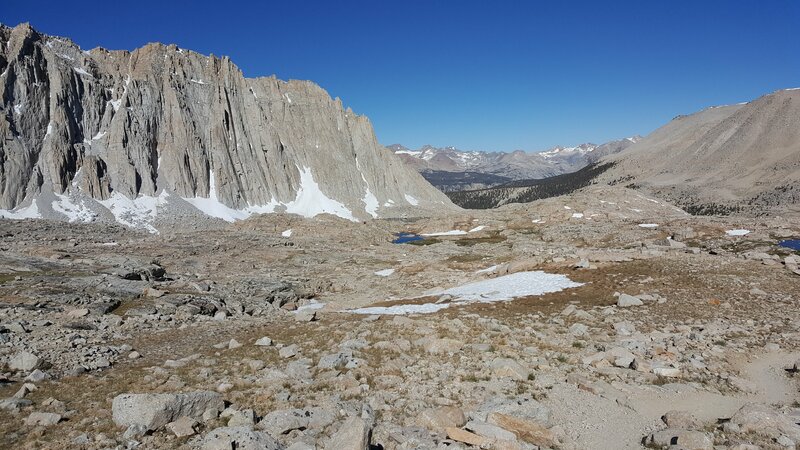 I sat there, head down, thinking, “Huh, I guess this is what altitude sickness feels like.” My head hurt, I was dizzy, and felt like I was going to throw up. Thankfully Hot Tuna and Flamingo Sunrise suggested we get down as soon as possible since they weren’t feeling great either. We started descending and I was shaking uncontrollably from the cold and my teeth were chattering. I kept reminding myself that the discomfort would be temporary, and soon enough, I was warm and feeling human again. The gang getting ready to get the heck outta here. Some of my favorite views were down from between the spires we were hiking around. I took my time on the way down and soaked in the views. It was neat to see the trail in the light, and the scenery was amazing. I was feeling ecstatic both because the mountains were amazing and because I was now feeling like a solid 8/10 instead of a 2/10. 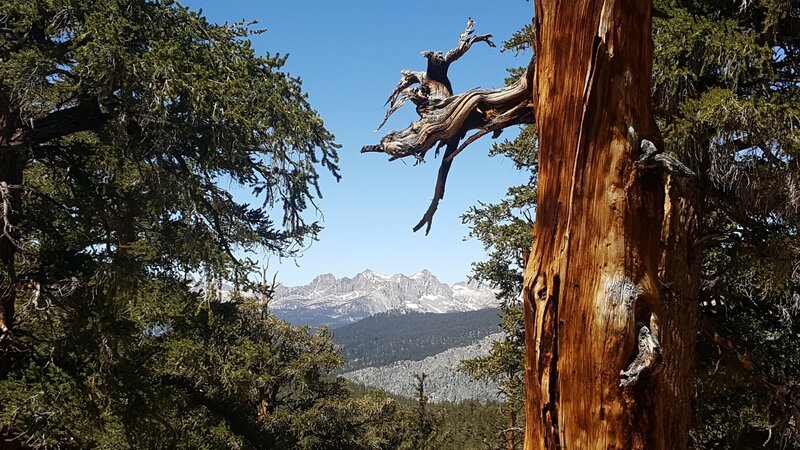 Views on the way down from Whitney. The formations on the left were so dramatic. Once we got down we spent the rest of the morning relaxing at Guitar Lake, then we continued hiking after lunch. 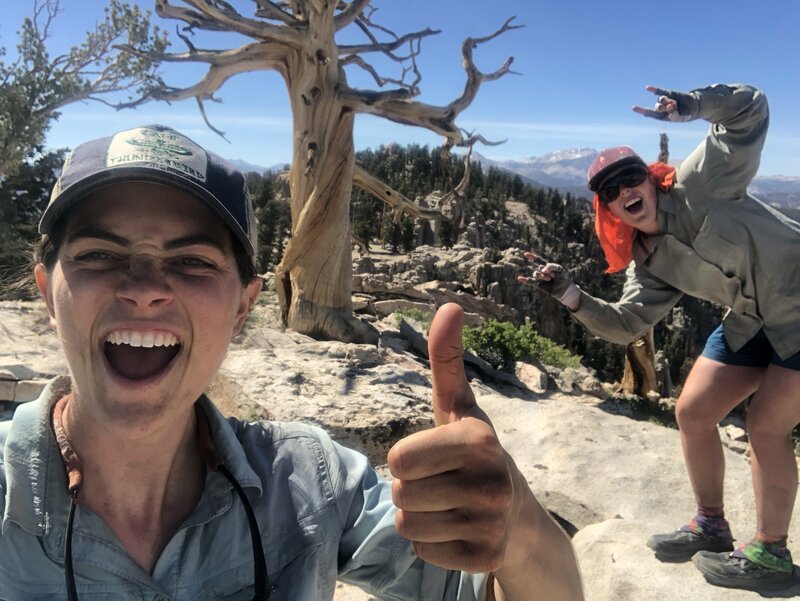 I am thankful that I am hiking with two people that value spending time in each place we get to, rather then being in a hurry and speeding by these incredible places without getting to experience them. Thankful that I get to go through the Sierra with these two champs! All in all, my Mt. Whitney experience was so worth the pain and discomfort. 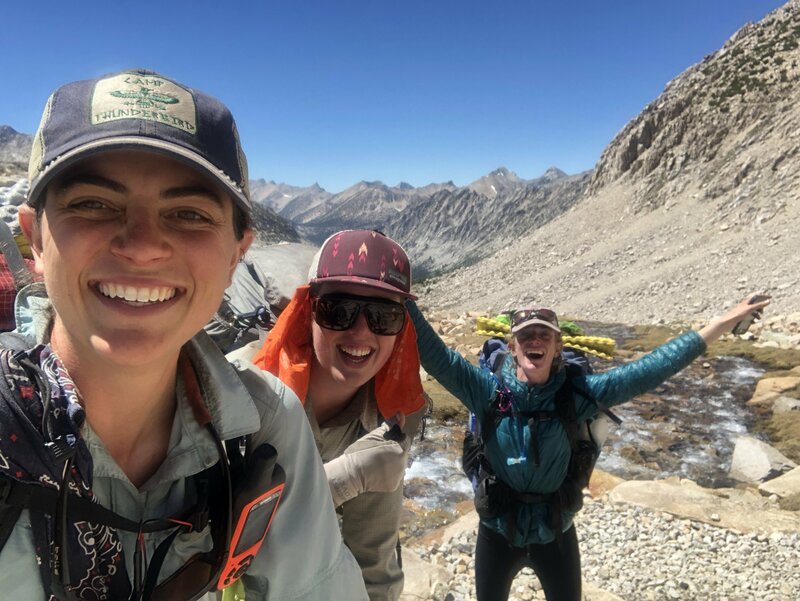 You can’t truly appreciate being warm until after you’ve been that cold, and you sure feel thankful when you feel good at the top of Forester Pass the day after experiencing altitude sickness for the first time. 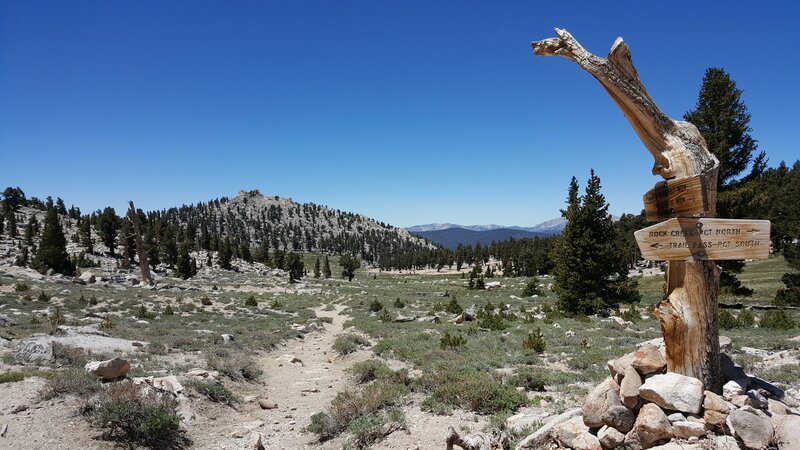 Our first few days in the Sierra were exciting because we started getting views of the mountains and the terrain was much different than that of the desert. However, the past two days were the most eventful, so I decided write about those. Finally, here’s a collection of some of my other favorite photos from the past seven days. Flamingo Sunrise takes an aggressive selfie. Thanks to Loz for keeping my head warm. I love my Putney Bobble hat. We are starting to get used to crossing rivers daily. Getting a view of the mountains before we got into them. Morning miles are my favorite. The view a short distance before Chicken Spring Lake. I went for a swim in Chicken Spring Lake. This is one of my favorite photos because of how the branches are lit up. Hot Tuna and Flamingo Sunrise looking over the dry Owens Valley. Neat boardwalk through a marshy meadow. 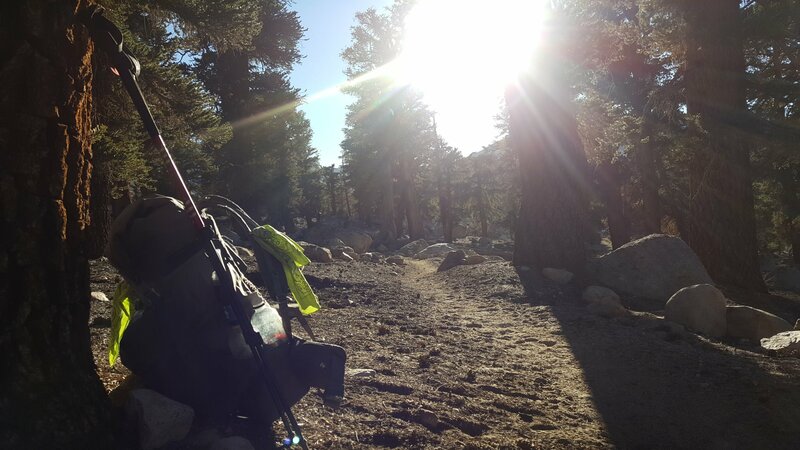 Soon we will head off to start our next section of the Sierra. I have thoroughly enjoyed my time in this beautiful place so far and I am looking forward to what’s next. You are making the best of every part of the trail. Love your writing and photos. Will you be writing something for the Morning Star? Or a magazine? You are a great role model for others. Keep having fun. Thanks for the kind words Patti. I will be sticking to my blog for the time being, but who know what might happen in the future! Wow! Taylor you are seeing so many places few will ever experience. I admire your fortitude and sense of adventure. Thank you for sharing so many special moments.